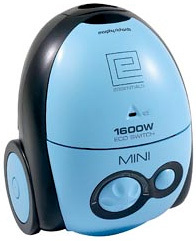 Morphy Richards Mini Bagged 1600W Cylinder Vacuum Cleaner | OhGizmo! By Andrew Liszewski on 04/03/08 • Leave a comment! As much as I like the high-tech looks and design of the Dyson vacuums (not to mention their performance) they tend to be a bit overkill if you’re not chasing toddlers or shedding pets all day. So if the biggest mess in your bachelor apartment is a few Doritos crumbs, this miniature bagged vacuum from Morphy Richards should be more than adequate for getting the job done. Even though it’s small (making it easy to store) it has a 2.5 liter capacity, 4 stage standard filtration, retractable power cord, a set of on-board tools and a hose that can be stored on the back of the vacuum when not in use. It even features an ‘Eco Switch’ which is an adjustable power dial that can be turned down when cleaning delicate fabrics and upholstery, or when you want to minimize your electricity bill. It’s available from Morphy Richards for about $60.